Confidence was high approaching this Mountain Marathon. Following the (still) amazing result at the OMM Lite a few weeks ago, described here, I was well up for the ROC, formerly the RAB. This event has changed quite a bit over recent years as the new owners (Ourea Events) seek to leave their mark. What attracts me to this event is that you can compete as a solo. Most MM’s are aimed at teams of two, so this one is a real novelty. This would be my 6th RAB/ROC. Since the OMM Lite, I had kept my running to a minimum, wanting to be rested for the ROC and had decided that my regular Tuesday CleM runs (about 10-13km per evening) and one other 10km run the weekend between would be enough to ‘turn my legs over’. the Tuesday before the weekend I went off for the usual session BUT with new Mudclaws on. Fresh out of the box, I wanted to bring these in to circulation as the RAB previously has finished shoes off – and I mean absolutely trashed them, so I thought I would be ahead of the curve and get some km’s on some new shoes, leaving my regular pair ready for the weekend. That was mistake number one! I have worn classic Innov-8 Mudclaw 300’s for the past x many years, I have had well over ten pairs, same brand, model and for the last three pairs same colour and probably even the same batch, as I bought a job lot from Pete Bland Sports in a sale. This was the last pair from that batch – why would they be any different? Clearly they were and for whatever reason, this pair gave me a hot spot on my left heel two km’s in to the run and by km three I knew I had a blister… I stopped, had a look and thought with a bit of re lacing I could get back to the van/pub at a slow trot. Wrong. Within 500m I had bent the back of the heel down and was running gingerly as I was now wearing the equivalent of fell running Crocs…. (a gap in the market may be?) I left the group and made my way back to the pub. The blister,from the Tuesday evening run. Picture taken on the Thursday evening before the ROC weekend. I am pretty good at managing and treating blisters, learnt over many years walking, running, first aiding on running events and reading many articles/books etc, particularly “Fixing Your Feet” by Jon Vonhof (well worth purchasing – here) so I was confident I could get to a point where I could trot round the ROC, I may not get the result I was hoping for, but still, I would be there… with expectations suitably lowered. The ROC arrived, or rather I arrived in South West Cumbria, in the shadow of Black Combe, near Millom and I was ready to start and collect my map and control sheet. The premise behind a “score” event is you have a time (6 hours day one, 5 hours day two for the ROC) to find as many controls as you can over a given area. You get the details at the start line and it is part of the challenge to formulate a plan/route that allows you to collect as many controls on your electronic dibber as you can and get back to where you need to be – in this event an overnight camp- before the time runs out and you start to lose points by way of penalties. I have lost all my day one points before on these events… gutting to say the least! Mistake number 2 then was a real school boy error. somehow in my haste I marked up the map incorrectly and gave a control a points value when it wasn’t in fact live that day – or indeed in use at any point over the weekend! This tipped my route choice into a direction I otherwise wouldn’t have taken. I realised my error as I was charging along to what I thought was the first control. I reached for the control description, expecting to see something like “stream source” or “spring” looking at how the map was marked but what I found was nothing. Control 210 wasn’t even on the live list, so why and how I had given it a value of 10 points was beyond me. I quickly checked the others I had marked…. all fine. Phew! Not for the mad house yet then… but that took up more precious time. Oh well, I will carry on, I will lose more time if I head back and take an alternative route from the start, the next control about a km away, was in my plan anyway, I’m just down a few points than I had expected. It was at this point that the cloud came in. 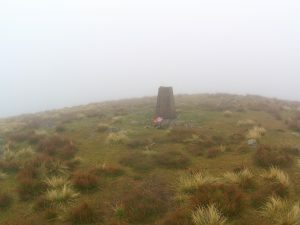 The weather forecast for Saturday was clear, overcast, but not raining and clear visibility on the tops. 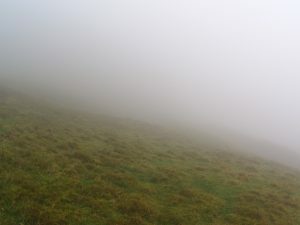 By 10.30 am the cloud base was down to about 400 m, it was very damp in the air and any chance at a view was lost. Now I am a good navigator and back myself in poor conditions like this, but with a scrambled brain from trying to understand why I had made a control up, sore heel and still cursing myself for starting so poorly my relocation took longer than it should have, with the added pressure being against the clock brings I was getting decidedly cranky! Several expletives may well have passed my lips, much to the amusement of the ever present Herdwick Sheep on Black Combe. Rumours I asked ‘lost’ fell runners still on the hill from the 2016 championships held here are unfounded. I got there in the end- the next control a 20 point one loomed out of the mist. The game was on! I tore off north east following a trod heading gently down I was certain about my location and where to head next and the terrain was very runnable. This would still rank as my worst start ever – 2 hours in and only 20 points! I then came across three other competitors, a solo male and a male pair, all studying their maps and with compass in hand. They didn’t know where they were with any great conviction, so I advised them accordingly. “We’re here mate”, much gratitude was expressed and the pair carried on their way, the solo – a chap named Dan on his first MM asked to team up for a while. Sure, with no view, conversation would be good for the next few km’s! Dan was clearly a better runner than I and as we got lower down and the visibility improved he sped off to follow his own plan. From here on in I was navigating to my usual standard and hitting controls exactly where I expected them to be. I still get a massive buzz from that, but essentially the damage was done. The poor tactics, dodgy heel and slower going in the clagg meant I was in damage limitation mode and the main objective was to get back to camp without incurring penalties, which I was able to do and got back in with a meagre 200 points and four minutes to spare. My plan had seen me get somewhere between 270 and 300 which would have left me comfortably mid table at half way, instead I was languishing in the bottom 20 or so 90 something out of 113. But tomorrow was another day! Day two and the weather was much improved. Feeling good and less achy than I usually feel on day two of these things and with a heel blister that hadn’t got any worse I was raring to go and at 8.13 am I dibbed out of camp to head back via as many controls as I could in a bid to make amends for the previous days woes. And oh what a day. Stunning conditions, runnable, although wet ground and with clear visibility. It was like running a different event, my route choice saw me tackle some controls I had visited the previous day (all correctly marked up this time!) but the views were stunning, with Eskdale and the Scafell Massif to the north and the Irish Sea and coast to the south and west it was a view to inspire. The going was good and I was pleased with my lines and nav to the controls. We were all wearing GPS trackers supplied by Open Tracking (part of the Open Adventure team) and being able to review the routes you took is an excellent feature of the ROC -one I hope they continue to maintain. You can see my day one and two routes with each click search for my name or “303”. By two hours in from the five I had about 120 points… a much better haul! My day two total was 300, which placed me 53rd on the day from the 113 that started – which is where I usually am, mid pack, but because of day one’s error and conditions I finished overall in a disappointing 75th. 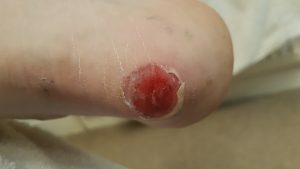 The heel is now healing nicely and although somewhere between uncomfortable and painful did not get any worse which was pleasing. Just as well as I am DofEing this weekend for Sam Sykes Ltd down south so will be on my feet all weekend. I almost wish I was competing at this year’s OMM… I’m gonna have to wait till 2018 for my next Mountain Marathon fix… Still, the adventure racing season is almost upon us! This short video captures the 2017 ROC nicely I think. OMM 3/4 length leggings, TNF boxers, Injinji socks ( a pair for each day), and a Berghaus LS tech tee. I wore a Haglofs windproof gillet also as main kit with an Innov 8 cap on top. I had a Montane Minimus smock and over trousers, both worn at camp. 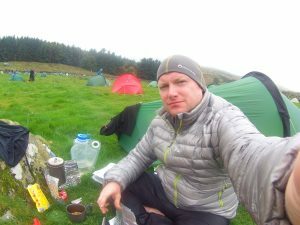 Also a Montane fleece jacket thing – very light and a Rab micro down jacket and New Balance full length running tights and a Montane beanie hat all worn at the over night camp and meeting mandatory kit requirements. Gloves (Aldi Merino ones) and a buff (race swag) were carried but not worn. I ran in Mudclaws – the classic 300s with the proper 10mm lugs – a well worn in pair! I slept in a PHD bespoke down sleeping bag, with a silk liner on a 3/4 Thermarest Neo Air mattress which has a slow puncture despite multiple repairs, it takes all night to go down, so it kinda works. Tent wise it is a TerraNova Laser Photon 1, with a foil blanket as a foot print to protect the floor. 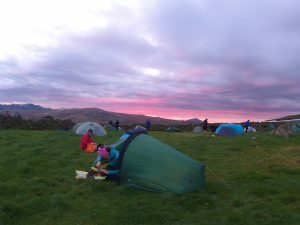 I use Alpkit titanium pegs rather than the tooth picks the tent comes with. I cooked on an Optimus Crux Lite stove and used a 650ml Evernew pan and 300ml cup (titanium)- it all sits together with an aluminium wind shield (home made). I used a 3 litre Nalgene ‘canteen’ for water capture at the camp and on the hill i used a 750ml SIS bottle – filled as a I passed suitable water sources. Food wise I used two small zip lock bags of trail mix, one for each day (Peanut M&M’s jelly babies, cereal bars cut into thirds and malt loaf) plus a couple of gels (SIS) and a Peperami and a Babybel cheese or two. Over night I used a mug shot and some Extreme Adventure Food (dehydrated beef stogganof – disapointing it was..), with a few handfuls of salted peanuts to finish the job of refueling off. (oh and maybe a small whisky to go with them nuts…) two tea bags, two lemon and ginger tea bags and a small serving of coffee for the morning and a porridge pot for breakfast. My first aid kit got boosted and I deliberately took a 50g tube of Sudacream and some dressings, relifix tape and moleskin to dress and protect the blister. This worked really well. The other stuff that’s in there didn’t get used. All this was carried in 2 dry bags and an OMM Jirishanca rucsack (35l I think – but it never seems big enough for that number, this is an old one – 7-8 years maybe, not sure they make them anymore.). A few extra bits like contact lenses, specs, a small MUVI Camera (poor mans GoPro! ), Smidge and a small ‘swiss army card’, lighter, gas cannister partially used one weighted in at 200g and titanium long handled spork thing (Alpkit again). Despite carrying a tent and sleeping bag you are supposed to carry an emergency bivi as well. I took a SOL Emergency Bivi cause its tiny and light. I took an Alpkit headtorch, whistle, red and black sharpies for map marking on each day, my phone (off) in a sealed bag as it is GPS enabled. I have a small PAYG hill phone, but discovered it wasn’t working to late to do anything about it which is a shame as its very light an weighs next to nothing where as my Phone is a Samsung Edge brick type thing…. All of this kit is well tried and tested – no issues with any of it! I think that’s all the stuff I hauled about, oh two Warburtons bread bags for my feet at camp. It weighed about 9kg at the start before water and was 7.5kg on the Sunday before water but including all my rubbish, which we quite rightly have to carry out. midway camp, waiting for the kettle to boil, detritus all around! Heavy for this sort of event – the elites would be running with between 4 and 6 kg’s. Personally I prefer a bit of comfort these days so as long as its around 9kg starting weight its good enough for me. 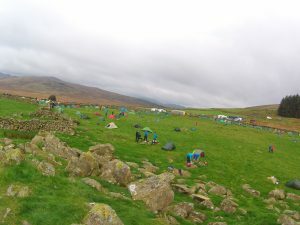 I camped next to a competitor who finished in the top ten – she was a tougher nut than I! With a real lightweight purist approach to her kit… may be one day eh?